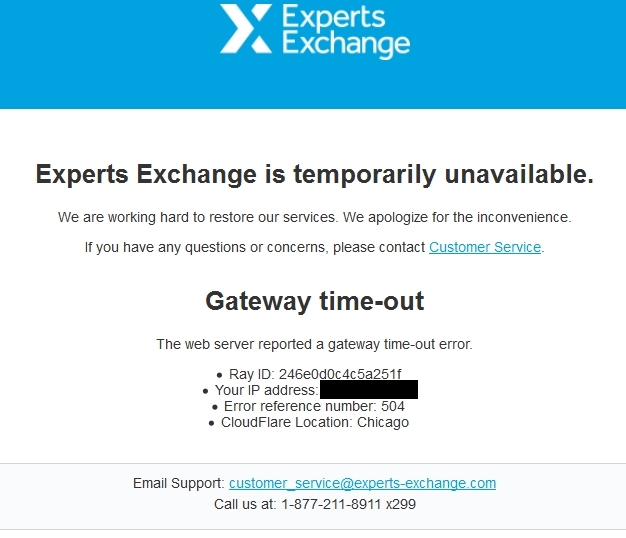 We're getting frequent reports of CloudFlare pages that look like this image: Please report any instances here (no screenshot necessary) including the local date and time, the CloudFlare location and, if you happen to think about it, the Ray ID. Your IP address isn't necessary either. Hey, Snap, I'm glad it's not just me! must be another DB failure, or Web front end failure! Update...we have been looking at our NewRelic data and found that at certain times of the day when our crons are running, the database and disk access times are peaking for a period of time that could cause slow downs and/or timeouts. We have scheduled maintenance this weekend to upgrade the environment which will at least give us more headroom. We are also looking as some of those cron jobs to see if we can optimize them. Look for relief by Saturday evening PST. Thank you, Gene. We can use Sunday morning as a new benchmark. You should also know that Avast Anti-virus doesn't like the Cloudflare SSL/TLS certificates at times. I had to turn off checking the certificates in Avast. Got a timeout opening a question. next refresh worked. Long delays trying to locate this thread but no timeouts. Thanks...I will have the team take a look.